British Flowers Week is Here! Today marks the beginning of British Flowers Week, a nationwide event which runs from the 15th of June until the 19th. A celebration of homegrown British blooms, British Flowers Week is promoted by the New Covent Garden Flower Market, a London based wholesale flower market which is renowned for their range of flowers, foliage and plants. The campaign was originally founded in 2013 as means to promote the UK flower industry. An assortment of different events take place throughout the week including flower arranging contests, photo competitions, floral themed art exhibitions, workshops, popup shops and much more. You can also take to Twitter to join in by tweeting with the #BritishFlowersWeek hashtag with special Twitter events scheduled for Monday evening from 8pm to 9pm and Friday evening from 7:30pm to 8:30pm. In honour of British Flowers Week we are offering £5 off our very own Beautiful British Bouquet. 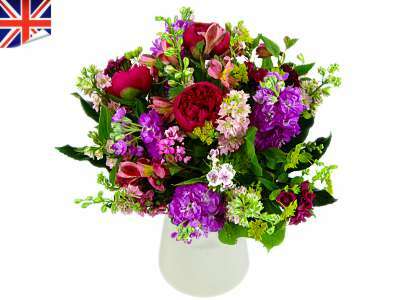 For just £29.99 you can have this exquisite arrangement of mainly homegrown flowers delivered to anywhere in the UK with free standard next day delivery included. Each Beautiful British Bouquet is unique; to ensure you get guaranteed fresh quality we will use only the freshest seasonal blooms. We also provide a deluxe option with this bouquet; for just £5 more you can add 50% more flowers. Optional extras include a glass vase, 96g box of Thornton's chocolates, a handwritten card and a cute and cuddly teddy bear. Let us know which is your favourite British flower or, better yet, send us pictures on Twitter or Instagram.